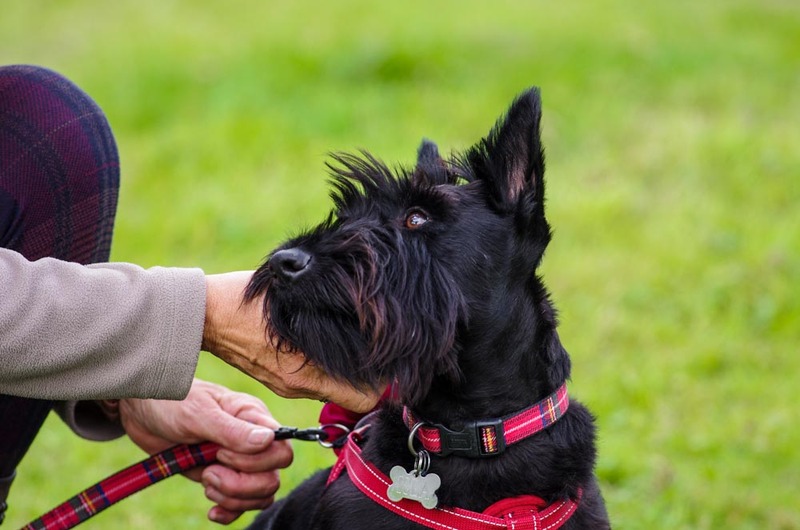 If you’ve adopted a Scottish Terrier for the very first time, congratulations! You are now the guardian of a playful, alert and intelligent pup, known for many positive traits, including independence. However, if you notice he gets anxious when you leave your home, then take heart. Separation anxiety can often be combated with patience and training. This condition arises in a vast majority of dogs of all breeds and Scotties are no exception. This post discusses the reasons why separation anxiety might exist and suggest ways to nip it in the bud. What are Common Signs of Separation Anxiety? Symptoms of separation anxiety include barking, chewing, pacing, and sometimes, “little accidents” in the home. If any of these occur, it is vital to understand from the outset that your dog isn’t trying to take revenge because you left him alone. Separation anxiety is very distressing for your pooch. All he wants is to be with you and the moment you close the door behind you, he becomes overwhelmed by fear and insecurity. The good news is that none of this is permanent. Studies have shown that dogs build similar bonds to their owners to those developed between babies and their caregivers. In one recent study, it was found that dogs performed better at tasks when their owners were present. The presence of an unfamiliar human, on the other hand, did not lead to improved performance, because motivation was lacking. This unique bond between humans and dogs goes a long way towards explaining the many physical and mental benefits that dogs bring to our lives. These include the reduction of stress, which when present chronically is linked to heart disease, obesity, and Type 2 diabetes. It is important for your vet to see your Scottie if you suspect separation anxiety. Your vet might find another reason for symptoms; for instance, a urinary infection may result in incontinence. Your vet might also suggest calming music, devices or natural supplements. Thunder vests, for instance, have a good reputation among dog owners for lowering anxiety and can be especially useful when there are loud noises or fireworks aside and you need to be at work or otherwise separated from your dog. There are many natural ways to try and quell behaviors, including taking your dog for a long walk or run daily, so he can expend his excess energy. Chew toys, meanwhile, can keep your Scottie stimulated, especially when there are treats hidden inside. Finally, you can think of creative ways to separate your dog from furniture he tends to chew. A baby gate or similar can be very effective. Once your vet diagnosis your pooch with separation anxiety, desensitisation training will be recommended. This involves getting your dog to understand that you will always come back to him. Start out by lowering the stress he feels as soon as he realises you are leaving – i.e. when you grab your shoes or keys, or pick up your coat or handbag. Perform this morning routine, but instead of leaving, stay! Do this various times until you note he is no longer anxious. The next stage is to leave for a few seconds, coming back immediately. Increase this time frame little by little until your Scottie is alone for a few minutes, then an hour, then various hours. The whole process can take various weeks so be patient throughout. To stop separation anxiety in its tracks, try to lower your own stress levels. With patience and plenty of love, take practical measures at home, ease into training and experiment with toys and anxiety busting vests for your dog. Focus on all the wonderful things you are bringing to each other’s lives and rest assured that your dog will soon learn to say goodby, and even miss you, without suffering distress.